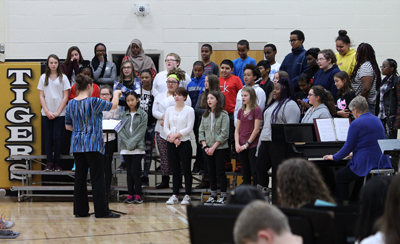 Fridley Middle School (FMS) held its 32nd annual Veterans Day Program on November 12, 2018. 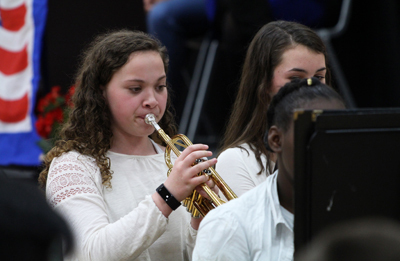 The program honors and pays tribute to United States military veterans and also serves as an opportunity to teach students about the dedication and sacrifice of military service members. 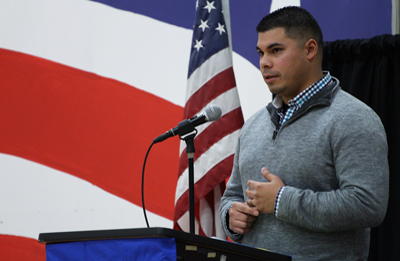 The program’s keynote speaker was Sergeant Ramon Gurrola, an eight-year United States Marine Corps Veteran. Gurrola served two tours - one in Iraq and one in Afghanistan. Currently, he is a firefighter for the Vadnais Heights Fire Department and is studying Criminal Justice at Century College. Gurrola, who is second generation Mexican-American, told students to always value their education. 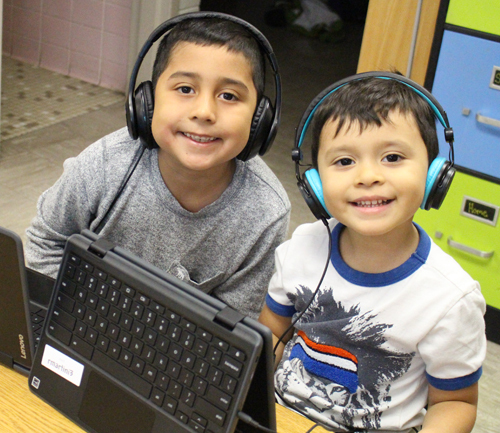 With education, hard work and determination, anyone can achieve their goals, Gurrola said. 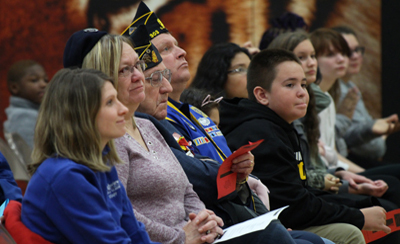 Three 8th grade students shared stories about the veterans in their lives. 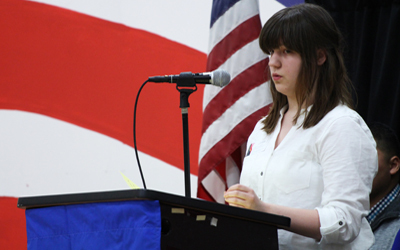 Kat Ribordy spoke about her grandfather, Richard Bergen, who served in the Vietnam war. Through the hardships of war, Kat’s grandfather found comfort in the friendships that he made with his fellow soldiers. 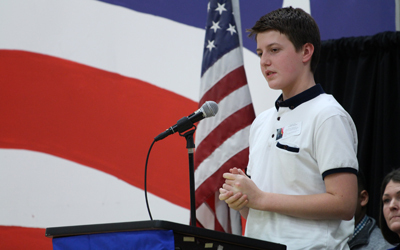 Eighth grade student Ismar Kalesic shared a story about relative Mustafa Kalesic, who served in the Yugoslav National Army (JNA). Kalesic served as a logistic officer of the Bosnian Army in the Bosnian War. Ismar said that the lesson learned by Kalesic is that physical conflict should never be a way to settle differences between two opposing sides. 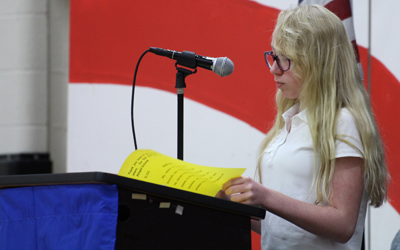 Eighth grade student Abigail Schmidt spoke about her brother, Robert J. Schmidt, who served in the United States Air Force and was deployed to Afghanistan. Robert loaded and unloaded cargo and personnel on and off the base. When he returned, Abigail said he readjusted well back to civilian life, but recognized that it is not so simple for others. She shared her respect and honor for those who choose to be veterans and sacrifice their lives for the country. Following the ceremony, community members and veterans enjoyed snacks and punch in the FMS cafeteria, which was decorated by the FMS Student Council. The students designed “Thank You” cards to present to veterans and also gifted a red, white, or blue rose to each veteran who attended. Top left: Kat Ribordy who spoke about her veteran grandfather Richard Bergen, who served in the Vietnam war. Top right: Ismar Kalesic who shared a story about relative Mustafa Kalesic, who served in the Yugoslav National Army. Bottom left: Abigail Schmidt who spoke about her brother Robert J. Schmidt who served in the United States Airforce and was deployed to Afghanistan. 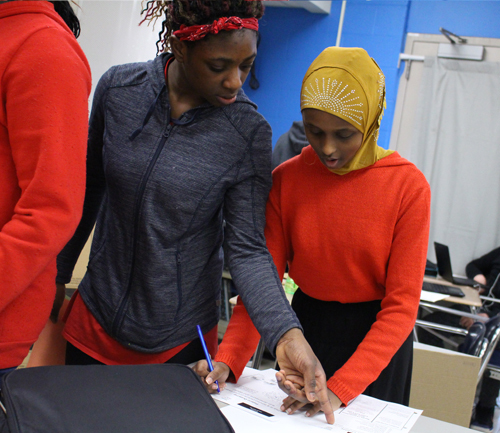 Bottom right: The Fridley Middle School Student Council decorated the cafeteria for the program's reception. 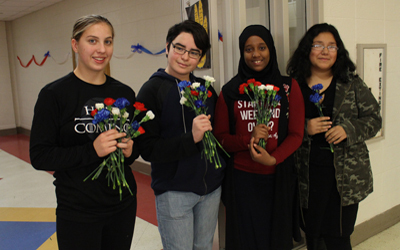 The students designed “Thank You” cards and also gifted a red, white, or blue rose to each veteran who attended.